Minimum of 2 people for departure. Half price for children under 12 years old . Free for children under 5 years old accompanied by a parent Entry fees to museums and monuments included. Cancellations made on the day of departure will incur charges of 100% of the booked price. 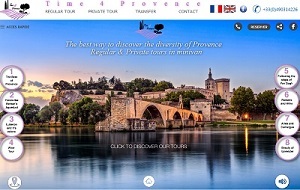 Some services marketed on Time4Provence and its affiliated websites are subject to availability. No claim can be made if the selected service is not available. Any reservation will be deemed effective upon receipt of the booking confirmation by the customer and not of the payment confirmation sent by Time4Provence. Users can only order via the Website once they have accepted these General Terms and the Specific Partners Conditions that may apply. The order confirmation, which contains the essential elements, such as the identification of the Service(s) ordered and the price, shall be forwarded to the User by e-mail within a short time following the date of the order. The prices mentioned, on this website are per person and in Euros, unless otherwise stated. Unless otherwise stated, prices include all taxes. Prices are subject to change without notice, and shall become final only upon receipt of confirmation. The pricing is not in itself a guarantee, the latter being listed as a guide, especially for currencies. Prices include all the services specified in the description of each tour or activity. Prices quoted on this website are valid only for bookings made on the website, directly online. Promotions listed on the website are valid only on the latter. They cannot be claimed on another sales channel. They meet certain characteristics, particularly the dates that are mentioned. Payment shall be made at the time of booking by credit or debit card only, via the secure payment system, at no extra cost. To confirm a reservation, full payment must be made. The price corresponding to the service reserved is charged on the credit or debit card. As part of an order for which certain services could not be confirmed due to lack of availability, the price for the services that are unavailable shall be re-credited to the cardholder (less the transaction fees) within 72 hours maximum. Time4Provence guarantees a departure for a minimum of two persons on the same activity. A single person can make any booking on the website but may be contacted by email a few days before departure in case no other reservation would have been made on the same tour or activity. In that case Time4Provence commits itself to suggest any other possible option to the client or to refund the total priceof the tour(less the transaction fees) as soon as possible. All the tours start at the time and place mentioned on the clients booking confirmation. The customer commits him or herself to be ready at the departure point at least 10 minutes before starting time of the tour or activity. In case of client's delay, the driver will only wait for a maximum of 15 minutes in order not to penalize the other passengers. After 15 minutes Time4Provence does not guarantee departure for clients arriving too late. No claim can be made by customers if they are not on time and Time4Provence cannot be held responsible for their delay. If the client is not on time at the departure point, Time4Provence will consider this as a "no show" and no refund can be claimed. Time4Provence cannot be held responsible for delays due to the traffic conditions, accidents on the public highway, especially when getting on or off the vehicle; or for robbery or loss of personal effects or luggage. The customer can require a modification of his booking (with the exception of the services listed as "cannot be changed or canceled"). Until D-2 from the date of use of the service booked, no fees shall be required (except for the services listed as "cannot be changed or cancelled"). Any amendment of date or content cannot be guaranteed and shall be applied subject to availability. Any change request must be sent to contact@time4provence.com (specifying the customer name, tour number anddate), which shall process the request as soon as possible. For services for which it is indicated "cannot be canceled or modified" or those on some special dates, no change is possible. Any interruption during the tour or activity decided by the customer him or herself cannot be a reason of refund. Any customer who will not be at the departure point at the starting time mentioned on the voucher will be considered as a "no show" and no claim of refund will be accepted by Time4Provence whatever the reason of the customers delay.